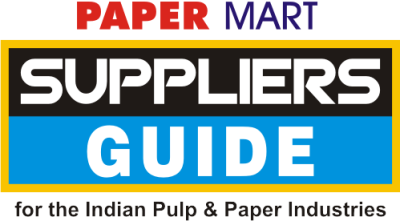 A definitive guide to pulp and paper companies, Paper Mart Suppliers Guide gives valuable information on suppliers of different kinds of equip-ment & consumables according to their business categories. The Guide includes business categories like automation and instrumentation; calendaring and finishing; chemical recovery; convert-ing equipment; de-inking systems; drying equipment, heaters and heating equipment; installation and servicing; machine drives; mana-gement consulting / engineering; mill maintenance / upgrades; minerals and pigments; paper machine clothing; paper and paper board making machinery; power/ energy equipment; process aids; pulp mill equipment; pumps, valves and piping systems; recovered/ recycled paper and fibres; rolls; screening and cleaning; specialty chemicals; testing and measurement equipment; tissue making machiner; transportation logistics; waste management; water handling and treatment equipment; winders and unwinders; wood handling and chipping, etc. The Guide, which is updated every year, is also an effective advertising tool for the industry. 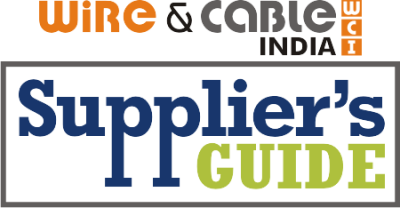 A definitive guide to wire and cable companies, Wire & Cable India Suppliers Guide gives valuable information on different wire and cable business categories. The Guide includes business categories like annealers and heat treating equipment; braiding machines, capstans, dancers, accumulators and pre-heaters; conductors and wires; consulting services, research and training; dies and die making equipment; drives, controls and process tools; extrusion lines, equipments and tooling; fibre optic cable and optical fibre manufacturing equipment; fillers, insulation, jacketing /sheathing compounds and colourants; guides, pulleys, sheaves and rollers; lubricants and process chemicals; marking and printing machines and materials; payoffs and take-ups; plating and galvanizing lines; quality control, measurement devices and testing equipment; reels, spools, baskets, cores, carriers and packaging; re-spoolers; rolling mills, flattening and shaping; rotating machinery: bunchers, cablers, stranders and twinners; surface treatment systems: cleaning, pickling, coating, chalking and de-scaling; tape applicators, binders, armouring and serving heads; tapes, yarns and binders; tension controls, brakes, clutches and traverses; used and rebuilt equipment; wire and cable handling equipment; wires and conductors; wire and rod drawing machinery; wire bending, forming and fabricating, etc. ​Considering the need of an interface for the paper buyers ie. paper traders, printers, publishers, station-ery manufacturers, corrugators, packaging companies, international paper buyers etc, Paper Mart has taken the initiative to bring out the Paper Guide reference book for paper buyers where in it includes product-wise information of all the paper & paper board miles of India and extensively updated sales contact information. ​Paper Guide is a reference book for paper buyers and is merely a compilation of mill information sourced/obtained from public sources for information purpose only.